Compact Granulators of the GSC series are well suited to granulation of injection & blow moulding scrap, profiles, sheet & film thus making them ideal for in house recycling. 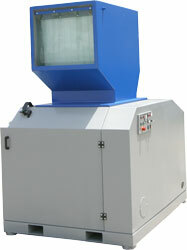 GSC compact granulators are supplied with a fully enclosed sound proof enclosure resulting in reduced noise emission. The sound proof enclosure allows easy access to the cutting chamber during rotor/stator knife servicing & screen removal. The sound proof material used is based on the latest technological research. The completely welded cutting chamber in conjunction with the �V� type rotor design ensures dependability in operation & universal application use. The cutting geometry of the GSC series allows material feed even with voluminous types of material. The complete GSC series achieves a high quality granulate irrelevant of the material type such as injection moulded parts, blow moulded parts, profiles, sheet, film, etc. In order to achieve high quality regrind, metal separators & fines removal systems may be integrated on request. For abrasive materials, specially developed wear protection is available for the GSC range.